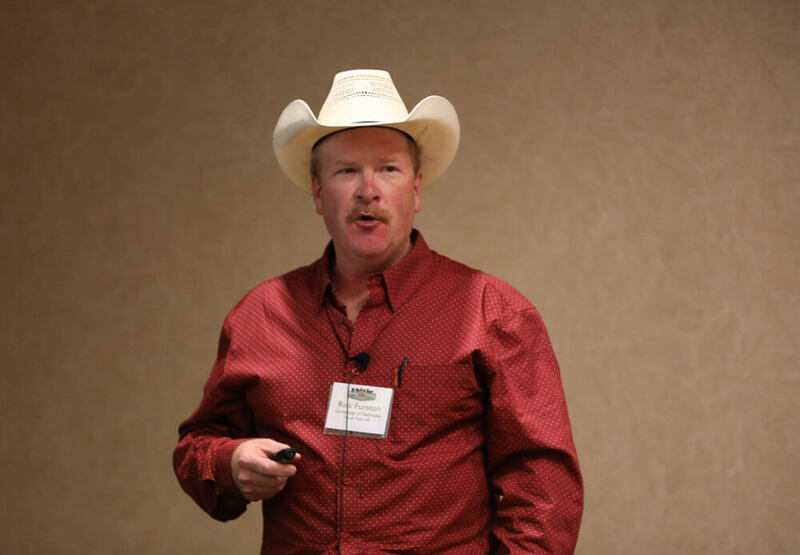 The reproductive physiologist with the University of Nebraska-North Platte addressed 200 cattlemen at the Feeding Quality Forum this summer in Sioux City, Iowa. While input costs should be minimized in times like these, “breakeven at best” for many, he said, it won’t pay to compromise fertility in the process. That’s why he focuses much of his work on replacement female development. Relatively cheaper feed such as corn residue may bring slower gains, but he noted that’s often no problem for five-weight weaned heifers that only need to gain 250 pounds. Aiming for 95% or more bred is folly, he added. “If I can get that, am I really selecting for the more fertile ones?” Better to get cattle to rebreed a few points lower than that, but on low-cost feed such as corn stalks. The forum was presented by the Certified Angus Beef ® (CAB® ) brand, with cosponsors Where Food Comes From, Roto-Mix, Feedlot Magazine, Tyson Foods, Intellibond, Zoetis and Diamond V.